One of the worst experiences in golf can be when you take a long, or downhill putt and you watch your ball roll straight past the hole and on into a bunker, especially if you are as bad at playing from the sand as I am. Those of us lucky enough to have been able to watch The Open Championship in Muirfield in mid-July may have seen Rory McIlroy do just that during his first, disappointing round. There were several videos of Rory’s embarrassing putt, but I see that the Open Championship have demanded that they be taken down on copyright grounds. At the time of writing the incident could still be viewed at this link. At any time, a player may choose to play a ball as nearly as possible from the spot at which the original ball was last played. 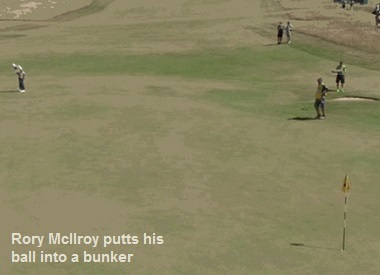 In the above scenario Rory could have lifted his ball from the bunker and replaced it on the putting green at the place that he had originally played from, for a penalty of one stroke. They may drop a ball in the same bunker behind the point where the ball lay, keeping that point directly between the hole and the spot on which the ball is dropped, with no limit to how far behind that point the ball may be dropped (providing it is still in the bunker). They may drop a ball in the bunker within two club-lengths of the spot where the ball lay, but not nearer the hole. In my opinion, the easiest way to obtain a better understanding of the Rules of Golf is to regularly test yourself on situations that regularly arise on the golf course. My eBook, ‘999 Updated Questions on the Rules of Golf 2012-2015’ makes this easy and fun. The book is divided into three sections, there are 333 simple questions that every golfer should be familiar with; there are 333 more difficult questions relevant to both casual golfers and Golf Club members; and there are 333 advanced questions for those seeing to expand their knowledge of the Rules. More information and how to purchase can be found by clicking on this link . The price is just $9.99, €8.99 or £7.79. Rule 24-2 (ii)(b) also gets the player out of the bunker with a one stroke penalty. I have since edited the relevant paragraph on my blog site, thanks to you and others pointing out my omission. You are quite correct. This is in addition to the omission noted above relating to when there is interference from an immovable obstruction to a ball that lies in the bunker. Casual water in a bunker is an abnormal ground condition. Rule 25-1b(ii) outlines the options for taking relief from this condition. There are two options for taking free relief by dropping a ball in the bunker not nearer the hole and one option for dropping outside of the bunker for a penalty of one stroke.